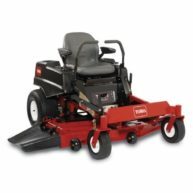 The Titan range of ride-on mowers features a bull-nose bumper, a Kawasaki® 726cc Engine, and a heavy-duty frame. Built to last, AND designed for user comfort, features a contoured 18` extra tall seat with armrests. In addition, Toro’s cutting technology always gives your lawn a superior quality of cut. 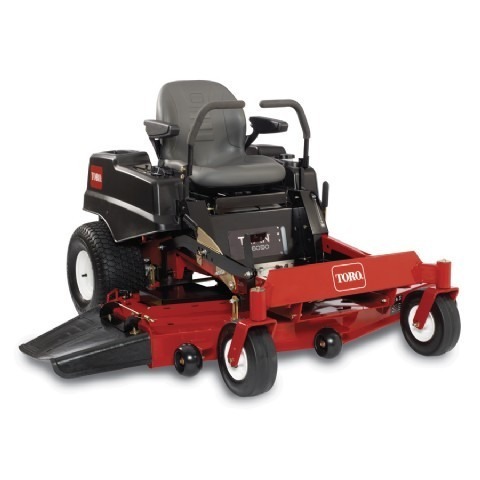 For an aggressive deck built to handle tough cutting conditions yet provide a truly superior quality of cut, Toro’s 11.4 cm (4.5`) deep, fully welded, fabricated deck is up to the challenge. The leading edge of the deck is reinforced with a Toro `Bull-Nose` commercial style bumper. Three anti-scalp wheels in front and two anti-scalp skids in the back help the deck float over rough terrain. Create your own natural fertilizer by using the standard Recycling Kit or make yard clean-up a snap with an optional Twin Bagging system. A 3.8 cm x 7.6 cm (1.5` X 3.0`) fully tubular frame forms the rock solid foundation for the rest of the mower. The large continuous frame tubes have seamless sides with no welded joints which provides maximum strength. The premium seating system on the TITAN ZX is truly a leader in comfort. The extra thick seat foam is contoured to envelope the operator in comfort and help hold you in place when traversing rough terrain. The seat is further cushioned by a unique adjustable seat spring suspension allowing you to have anywhere from 2 to 5 springs underneath the seat to give you customized support. A 10.2 cm seat slide is adjustable while seated to help give you just the right fit. Adjustable armrests and retractable seat belt come standard. This system allows you to quickly raise and lower the deck while mowing without taking your hands off of the controls. The HOC has a range from 3.8 cm – 11.4 cm (1.5` – 4.5`) with 13 positions in quarter inch increments making sure there is a setting just right for you and your lawn. These large tyres provide a smoother ride over rough terrain than smaller diameter tyres. The special tread provides the right mix of traction and reduced turf tear. Professional landscape contractors know that smooth tyres reduce turf wear and improve maneuverability.